CRANE DRAG-LINE SHOCK-PROOF VIBRATION RESISTANT FLOODLIGHTS SPRING MOUNTED floodlights are use for the most severe vibration occurring applications. Draglines, Cranes, Highway construction equipment, Offshore work boats, Off road vehicals etc. 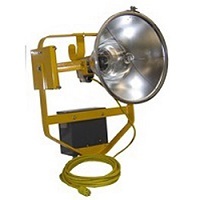 CRANE DRAG-LINE SHOCK-PROOF VIBRATION RESISTANT FLOODLIGHTS are easy to install. 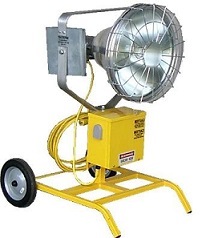 Operates off of 120 volt to 480 volt upon request of clients equipment. High Pressure sodium floodlights are recommended is areas where ice fog is normally present. HPS is the only light source that penetrates ice fog. LED is best recommended where clear day light requirements are preferred. Metal Halide is recommended when large areas of illumination if required from single light source. HPS and Metal Halide both require remote ballast mounting within the cab of equipment. LED the driver is mounted to the spring mounted fixture so no remote ballast is required. All three styles of floodlights are available with varying beam patterns. Client can order wide beam patters, 98* x 98* to narrow beam patters, 60* x 60 down to 20* x 20* sport beam pattersn.